Reviews may be affected by certain changes made in the Project to items in Review. If an item gets locked in the Project, Moderators will no longer be able to edit the same item. As they try to edit the item in Review, information about the lock will be presented. Also, the window will open in Compare Mode, unless the person who locked the item is the Moderator in which case the window will open in Edit Mode. If the Lock information shows Locked By the system it means that the item has been locked by Workflow. Even though the item cannot be edited, Moderators can still see the last changes, by selecting Compare Mode from the same window. If the item has not been modified while in Review, this option will show up greyed out. If the item has already been modified, a comparison view of the item will be presented. Although locked items can not be edited, a new revision can still be published with the items locked. 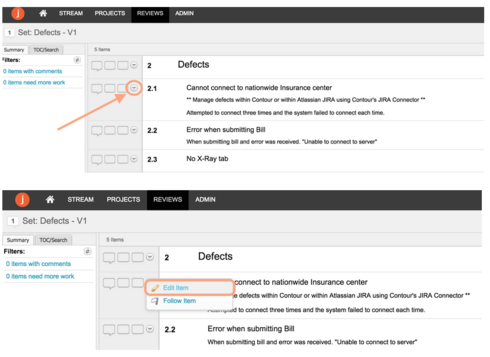 In case an item is deleted from the Project it will still be visible in the Review until a new revision is published. 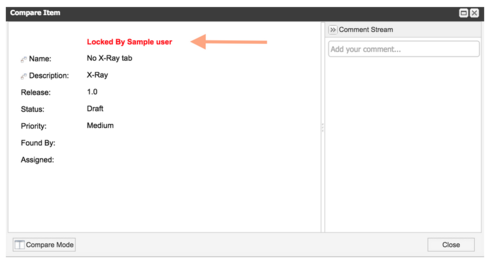 Moderators will be informed of the item's deletion if they try to edit the item. 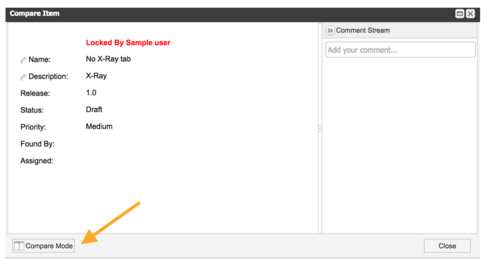 Moderators will also be able to see a snapshot of the item before the deletion. This can be done through the Compare Mode option, in the same window. When publishing a new revision, Moderators will be informed that the item is being removed from the Review. In case the deleted item was the single item in Review, Moderators will not be able to publish a new revision. If the items in Review are reordered in the Explorer Tree of the Project, Moderators will still be able to edit them in the Review. Moderators will not be informed of any change as they publish a new revision, however, the items will show up in the Review in a new order. If you move all the items in Review (the full Review's content) to a different location in the project, the Review will not be affected. In case some of the items in Review are moved to a different container in the Project, Moderators will still be able to edit those items in the Review, however, as soon as a new revision is published those items will be removed. Just before publishing the new revision, a message will be presented to the Moderator, listing the items being removed from the Review. Since moderators are responsible for implementing changes in the review, they are notified of any project changes impacting their review as soon as they attempt to publish a new revision. This is done so they can acknowledge and either confirm the changes, or revert them if necessary. 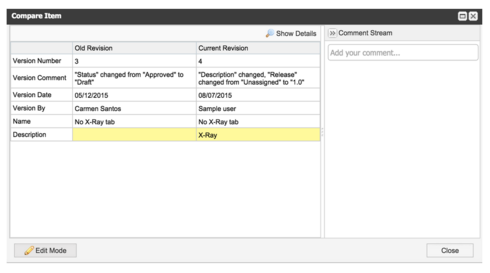 In case the items are actually removed from the review, the feedback is still kept, allowing reviewers to track the change through the existing comments just like in all other changes. I seem to have skipped this in the article, thanks for bringing it up! 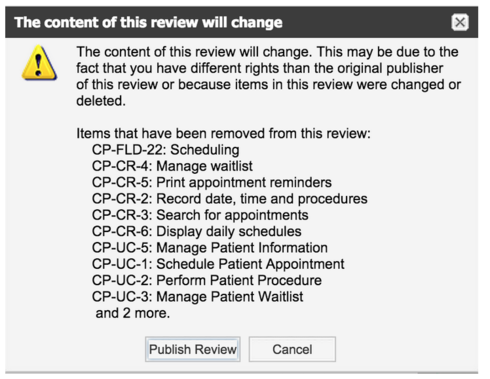 If items are deleted during a review, the moderator is notified but the reviewers are not. Is it the moderators responsibility to notify the users if an item is deleted? Why not just notify everyone? User B updates the project by deleting Requirement-10 but doesn't update Requirement-9 to encompass the functionality that Requirement-10 previously had. User A no longer has the feedback she provided available in the review center, nor does she even know that Requirement-10 has been deleted. 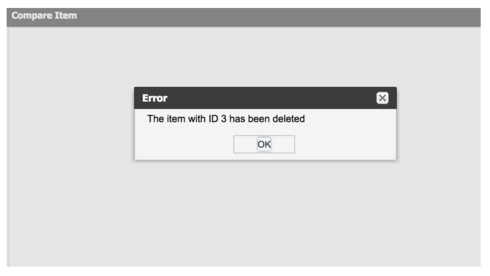 How do we avoid this kind of situation, given the way Jama handles notifications of deleted items and how Jama displays the thread associated with that item?